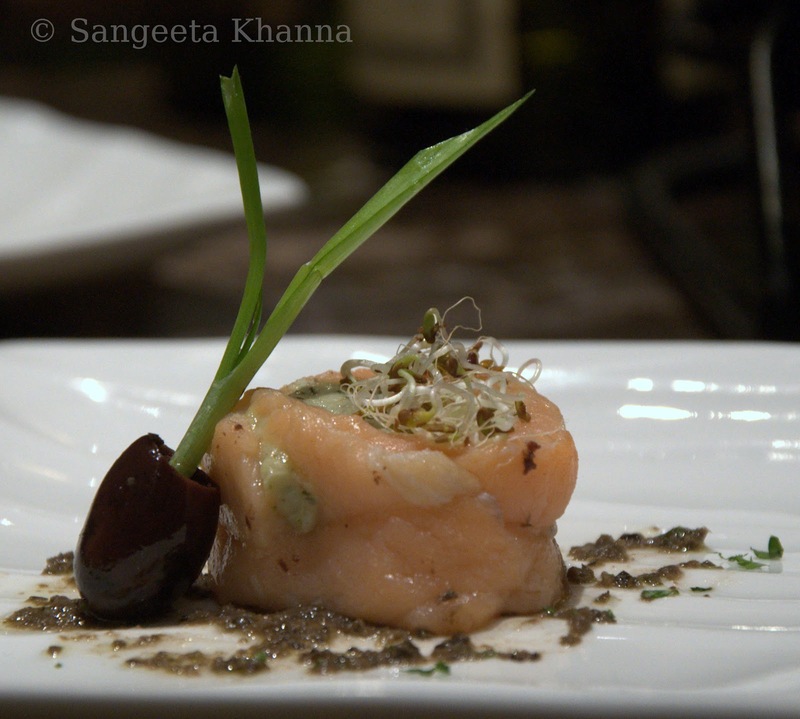 banaras ka khana: Review of the summer menu at Italia, DLF Promanade, Vasant Kunj..
Review of the summer menu at Italia, DLF Promanade, Vasant Kunj.. If you want to find a quaint little place in a buzzing mall it's not always easy. Unless the place is well known and you have already heard about it. 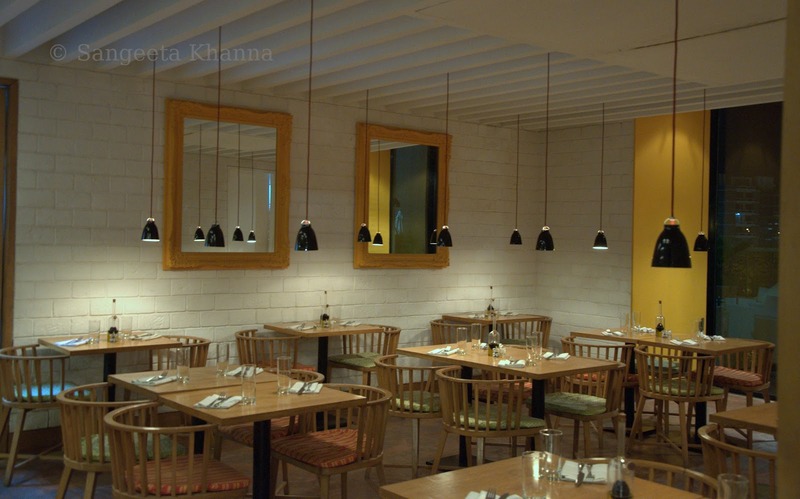 Italia at DLF Promanade Vasant Kunj is one such place you would find excuses to go to. 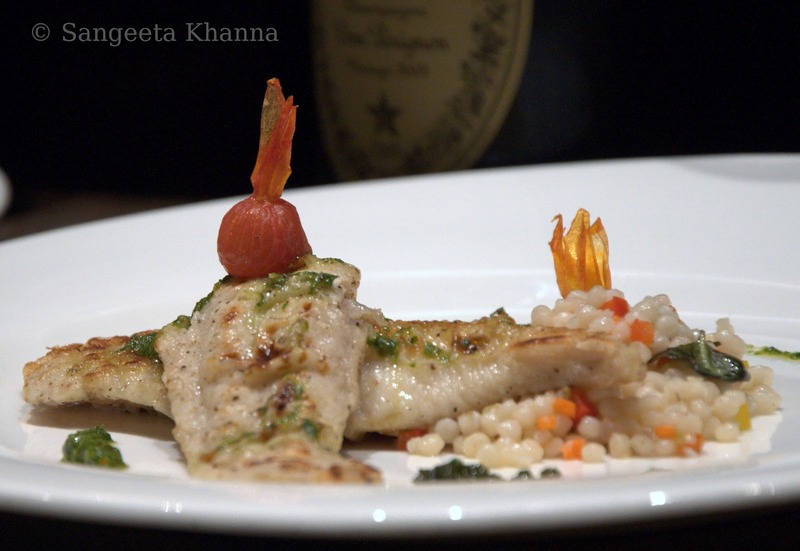 The bloggers' table at CAL was invited for a review of the summer menu at Italia last Friday.Such review invitations are always a great opportunity for us Delhi bloggers to chat, to click pictures and enjoy some good food over discussions of our newly tried recipes or cookbooks. A recent pastime is to tease Sushmita mercilessly for her collection of handbags. Her husband can be seen seen smiling gleefully when we are at it. So a bunch a happy blogger friends gets together and settles down to have a nicely laid out meal. We were greeted well by the FnB manager Mr.Vikas Sehrawat. 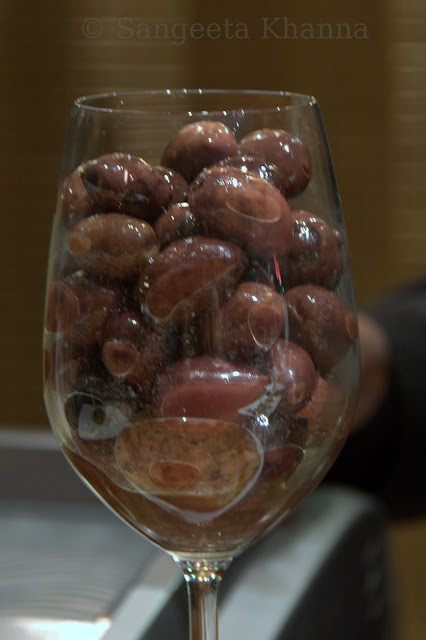 Chef Somopriyo Basu introduced us to the summer menu and all the varieties of Olives they were using and showcasing as a prelude to their upcoming Olive festival. 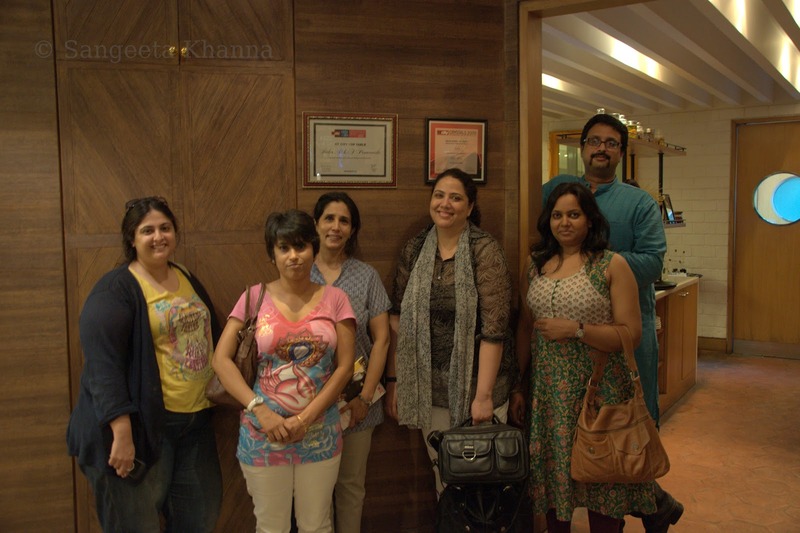 Mr. Abhijeet Bose (GM The Park group of Hotels) and Priya (PR Manager, Park Hotels) joined us on our table too. 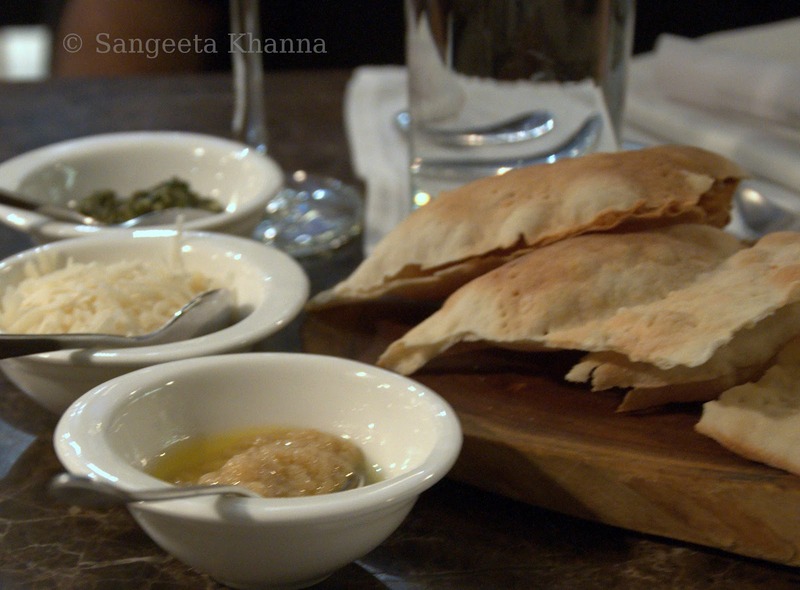 The sojourn with food starts with a platter of very thin crisp Focaccia with three different dips. A roasted garlic and Olive oil mash, some grated Parmesan and a Basil pesto. Chef Somopriyo told us they used to serve a multi grain Focaccia earlier but this thin crust crisp Focaccia was received better by the patrons these days. We loved it too. This would keep coming in constant supply. I polished off the bowl of roasted Garlic and Olive oil mash completely. My favorite flavors. Done well. That grassy thing seen on top is Alfaalfa sprouts which is quite fresh but didn't blend well with the flavors. Even when I love all my greens and salad servings. Four varieties of Olives were served on the table while we were poured white wine. It was Albizzia Chardonnay Toscana 2011 white. The thin Focaccia kept us company. 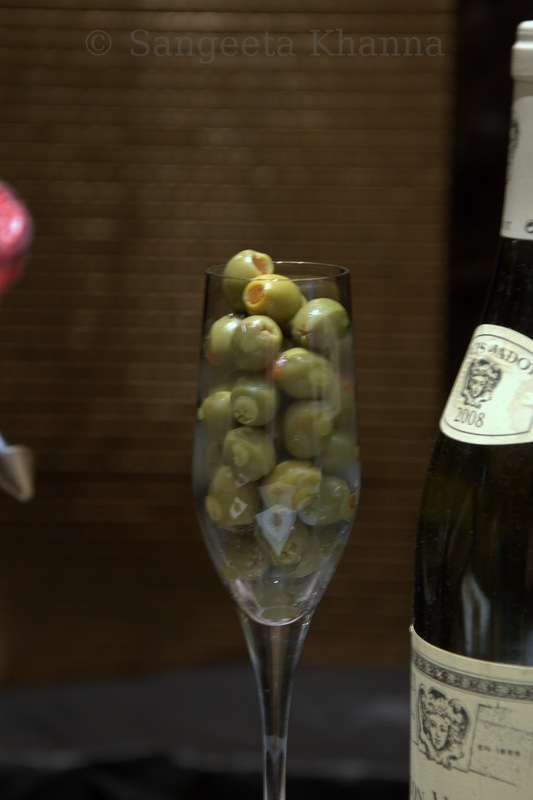 Look at the Olives and how they were served beautifully in stemmed glasses. We kept nibbling on them and talking non stop as we always do. BTW, the service was slow for every course and when we asked , Mr. Vikas Sehrawat told us very sweetly that they were giving us time to enjoy our banter and hence the delay. And a variety called Taggiasche Olives, a first time tasting for me, is very small and with pits. 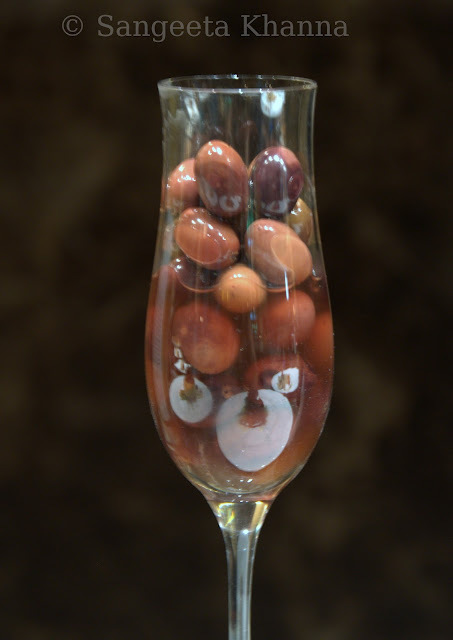 This one and the giant Colossal Olives were my favorite amongst them all. 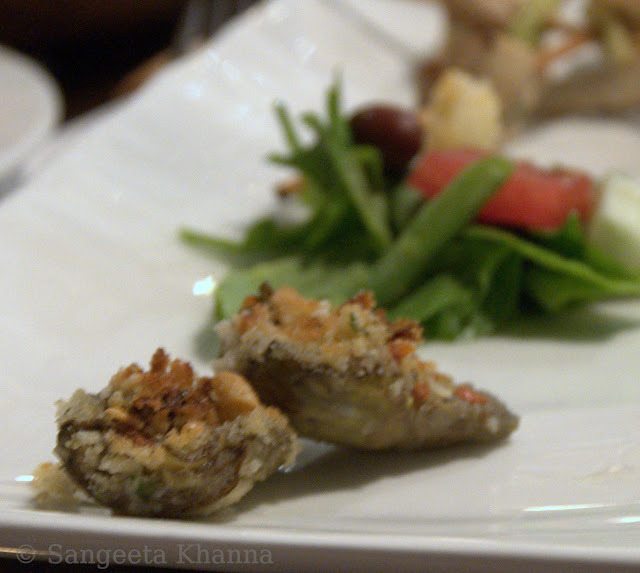 The vegetarian option in the antipasti serving was a nice baked Artichoke hearts with parmesan and Pine nuts. I tasted this too and liked it more than the non vegetarian platter..
On our plate was this Milan style Chicken with Colossal Olives. Nicely fried chicken with a crisp coating and some melted Parmesan over it. I liked it. 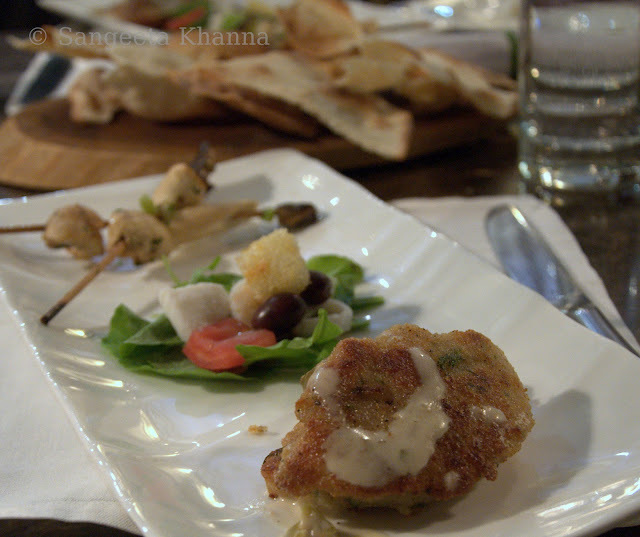 The greens and the mixed mushrooms skewers were nicely done, flavorful. I would have it again when I go. 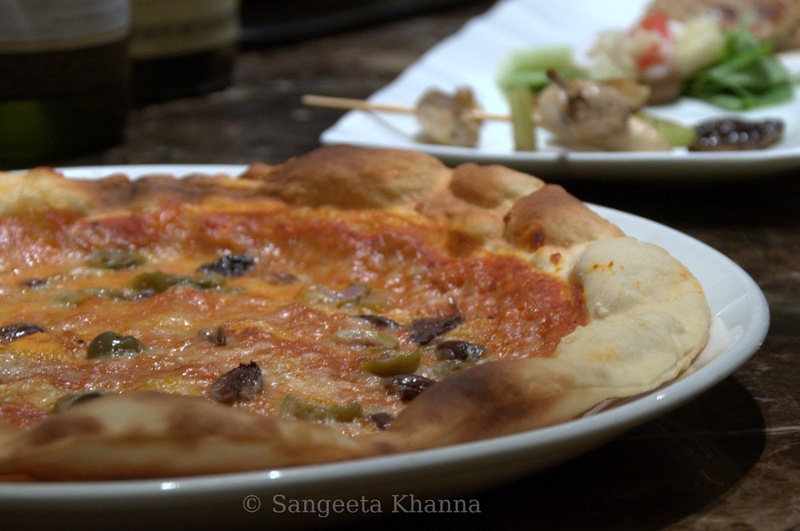 This Four cheese and four Olives Pizza is thin crust, baked in a wood fired oven and delicious. You wouldn't want to miss it if you like your pizza. Nice flavors melding beautifully. No cheese overkill. Spaghetti with Trapanese pesto was a downer. 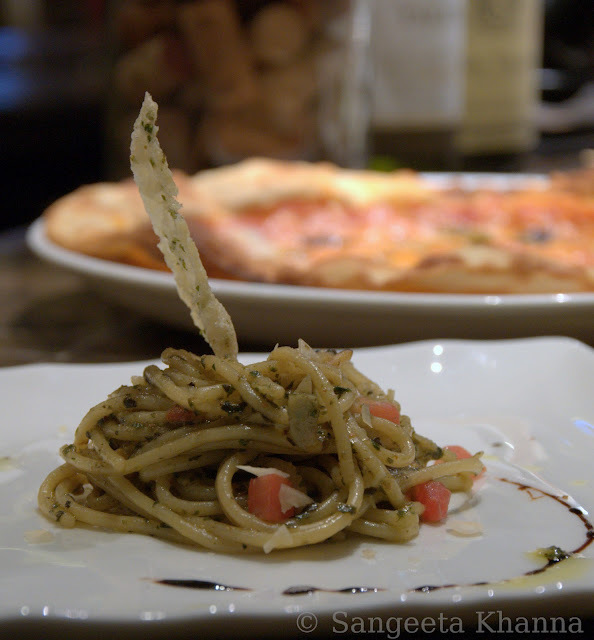 Under seasoned as I could perceive, but Chef Somopriyo told us it was the different kind of pesto (Trapanese) which is not too common. May be I am too beotted by my own fresh Basil and pesto. The Parmesan crisp over it was actually a soft chewy crisp (?). Nice flavors if it was a crisp. Chef asked all of us for the main course preference. There was fish, tenderloin beef and Polenta on offer. 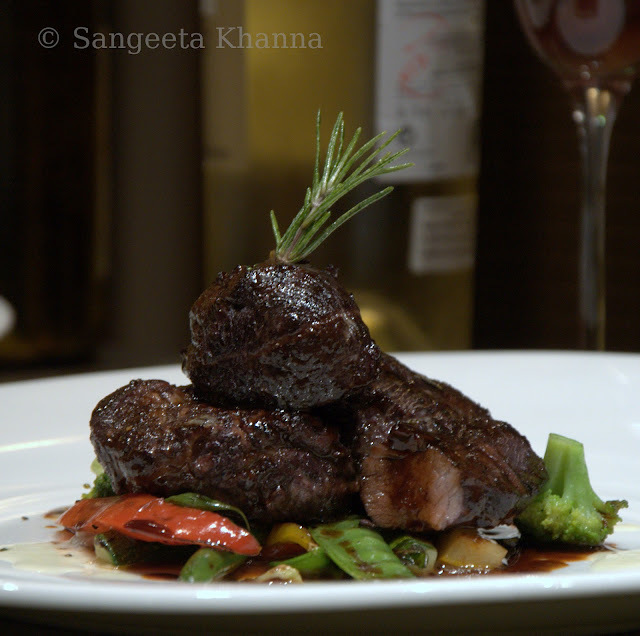 I chose fish for myself but decided to have a bite from Ruchira's Polenta and Sid's beef tenderloin. Nicely done fish, well seasoned and this Israeli couscous on the side was awesome. Nice little glutinous pearls with herbs and bits of veggies. Loved it. Polished it off. The Tenderloin medallions, garden vegetables and Rosemary foam was so good that Sid wasn't at all pleased when I asked for just a bite as he was relishing it like a hungry Bear. He parted with a scarce spoonful and I started almost regretting my Fish preference after tasting it. On a bed of fresh vegetables it was huge portion to finish. It was well done, juicy tender and flavorful meat. Would like to go there again for this. All three main course dishes were great. Polenta I love anyways and this one from Ruchira's plate was yummy. Fresh crunchy Asparagus and creamy flavorful polenta make a nice meal. It was a huge portion and could be a standalone meal for me. 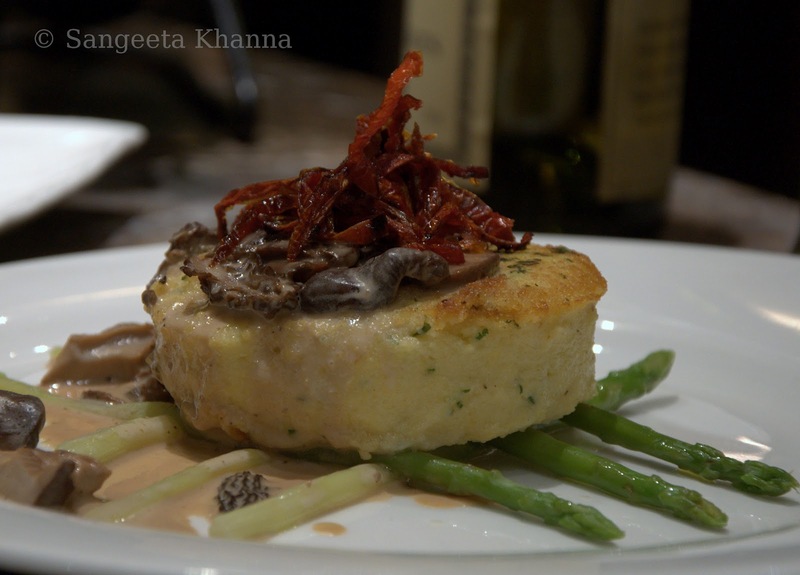 This is the plate of Pan seared polenta with Asparagus spears and mixed mushroom sauce. Every element enjoyable and as flavorful as the other. Dessert was a scoop of Olive oil (extra virgin) Gelato sprinkled with Olive dust and a huge wedge of Chocolate truffle cake. Olive oil gelato had a nice strong whiff of EVOO. Nice, creamy as a Gelato should be. The portions were so big we all shared our desserts. I dug into Deeba's plate. Still the both of us couldn't finish the Truffle cake. Couldn't click a picture of the desserts. We get distracted a lot when we talk nonstop. Many of my long time friends would be shocked to hear me talking this much. Yes, this foodie group is something where we all share great vibes. Touch wood. Rekha is the one ever smiling face, with a camera bag in her hand. 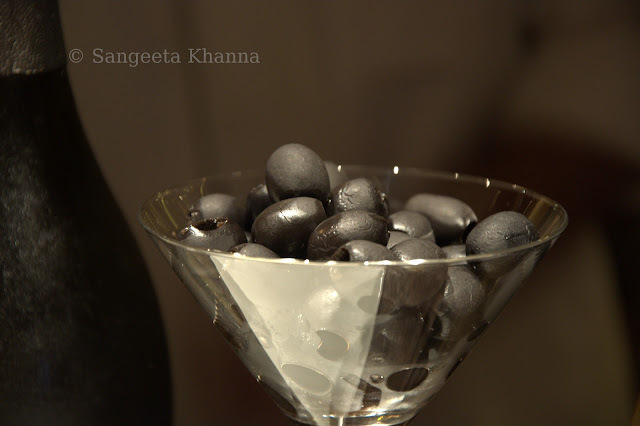 Sushmita, the one who gets teased about her handbags and The passionate baker Deeba. Another prolific and wonderful baker is Ruchira. Tanya Kohli joined our table at Italia but she had to leave early due to something. 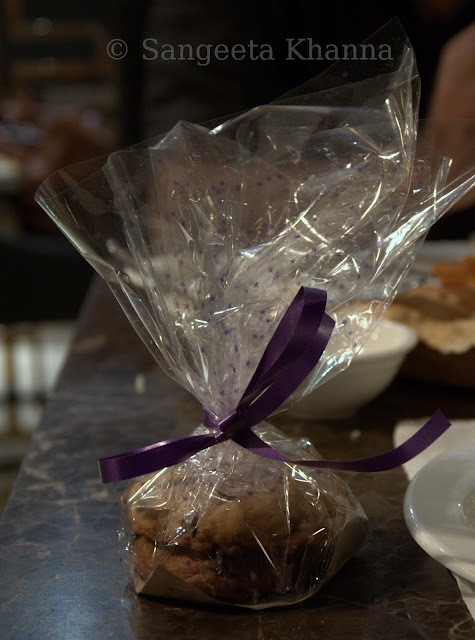 She brought nice chocolate chip cookies for all of us. Sid Khullar , the tall man in the blue-green kurta is the one who brings us all together. Don't we all look good together? Parul, Charis, Nachiketa, Rituparna and Prerna were missed sorely. Thank God there is always a next time. Tanya brought cookies for all of us and this is my pack, nicely packed and yummy choco chip cookies. yep..my hubby certainly enjoys u guys teasing me abt the bags!! 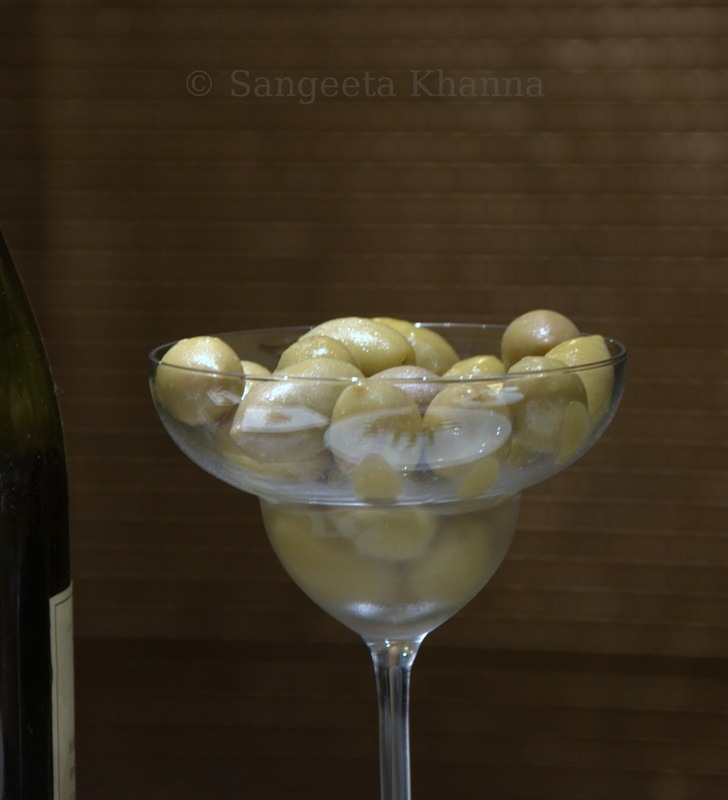 lovely read ..and the colossal olives...they were so yummmmmmmmmmmm! !